As a data expert, you know that most great ideas don’t strike like a bolt of lightning. They start with something slower: simple curiosity. They grow from “what if” to the seeds of an idea and, if you’re lucky, into some big next steps. Many people on your team might also have these “what if” ideas too. For example, maybe they’ve got an insight about how to optimize your marketing plans and drive better results. But they might need a little nudge to turn those ideas into something bigger. For your organization to consistently get from insight to action, it’s important to give people at all levels the skills and training they need to explore their hunches using data. After all, you never know where your company’s next great idea might come from. Here are three ways you can spread your data expertise to others, helping people beyond just a small team of go-to analytics experts. One way to have an impact? Help executives create a training plan by determining what your team needs to know in order to analyze the data they’ve collected. By identifying the gaps between what they already know and what they still need to learn, you’ll have the insights you need to provide your team with the right level of training. Once you run a training session, record it and keep it online for later use, and share it with anyone who couldn’t make the meeting. If you’re a go-to data expert on your team, sharing your success is one of the most powerful tools you have to spread data literacy. Look for time to recap the results of a recent A/B test and show your team members how you achieved results. That will get them excited about what they can do with data. 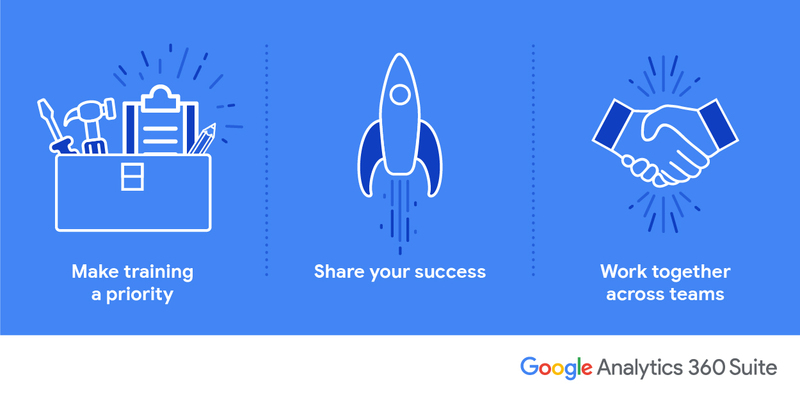 Also, don’t be shy — at every opportunity, recognize and reward others you see using data effectively. This helps build enthusiasm. Finally, use your knowledge and demonstrate proven business results to communicate what data can do. As an analyst, you may even want to start thinking of your role in a new light. Analysts don’t just pull reports — they weave data narratives and interpret how data influences business results. That brings data to life and shows its value to the whole team. By sharing openly, you’ll give colleagues the tools they need to answer burning questions or dig deeper into their own hypotheses. Looking for more ways to turn everyone one your team into a data-savvy marketer? We put together an infographic with 5 key steps to help get you there. You can take it one step further. Use your expertise to create and share easy-to-understand data reports outside your team. It’s a great way to help beginners make sense of recommendations and insights, and to get an idea for productive ways to use them. When sharing your data, make sure it’s organized and easy for all teams to access and understand. Include clear definitions and common metrics so that everyone is on the same page. To go above and beyond, tailor insights specifically for different teams. That way they can get a deeper understanding of the report’s value. And don’t forget to consider the ways in which you deliver the data — every team has its own preferred channels for communicating. Finally, don’t stop reaching out once you’ve worked to break down data silos in your company. It takes continued, active steps to keep data flowing across an organization. With training in data analytics, every member of your team can support big ideas with real data. That helps ensure those ideas are taken seriously. And, in turn, it encourages your team to continue bringing new, diverse points of view to the table. For more tips on sharing data expertise across your company, check out our resources on data-driven marketing.